Street view design by Ark Design and Architecture and Phi architects showing the relationship with the neighbouring 1930s semi-detached house. This project was to refurbish and update a post-war house in Heaton Moor, a 1957 bungalow that was extended in 1979. Its location in a conservation area required careful consideration of the site and its visual impact. Ark Design & Architecture (now dissolved) in Manchester were selected because of their simple and refined aesthetic, and their commitment to sustainable design. Link to Ark photo book. Ian Moores at Ark developed a proposal to remodel internally, provide more first floor accommodation, and clad the exterior with insulation (in non-technical terms to put a ‘tea cosy’ over the house). The external wall insulation together with high specification windows and a ventilation system which complemented a new heating system helped reduce CO2 and keep energy bills to a minimum. The internal layout was altered to maximise natural light and contribute to a sense of wellbeing. 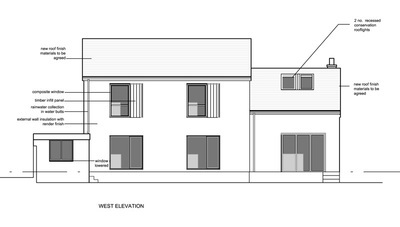 The scheme received planning consent in November 2013. The house was put forward to become an eco show home as part of a project run by Carbon Co-op with technical partners URBED, and funded by Stockport Council. The project aimed to foster a community approach to reducing carbon, and as part of this I was engaged as a Community Carbon Champion. A Household Energy Report informed the approach to the retrofit. It outlined how through a series of measures an EPC ‘A’ rating of 93 could be achieved, compared to the original ‘D’ rating of 63. This would meet the shared ambition of Carbon Co-op to reduce emissions to the 2050 goal of 80%. The design was later enhanced through the raising of the roof over the lounge to provide an additional bedroom lit by roof windows at the rear. The new design produced by Sara Darwin and Claire Jamieson of Phi architects would achieve the Passivhaus EnerPHit standard. Energy use and CO2 would be reduced still further with space heating requiring only 23 kWh m2 year. 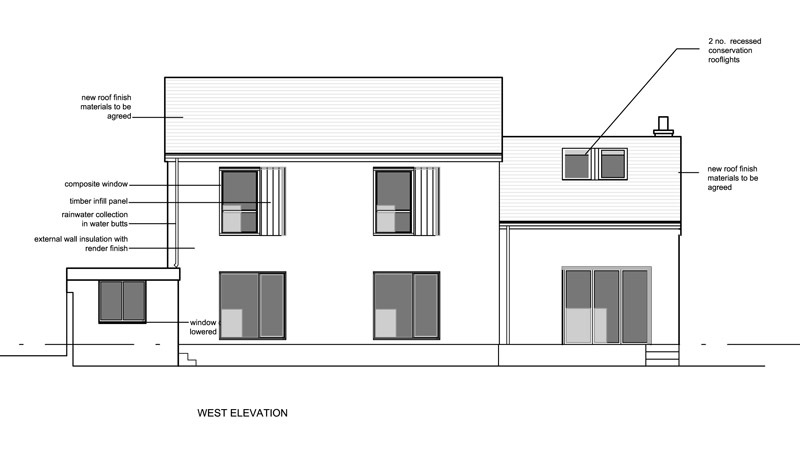 This part of the scheme received planning consent in March 2014. The house was part of the Carbon Co-op and Action for Sustainable Living open eco-house weekends in late May 2014 when tours of the house were given and plans explained. Whilst the full scheme has not been carried out a series of measures have resulted in the EPC being raised to a ‘C’ rating of 69.